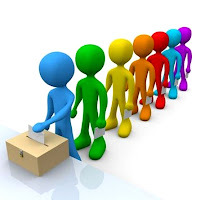 The Ukrainian parliamentary election of 2012 will take place on 28 October 2012, with the electoral process (campaigning) starting on 30 July. The Central Election Commission will announce the official result of the election no later than 12 November. All citizens of Ukraine over the age of 18 years old are eligible to vote in the election of the members of parliament (MPs) on an equal basis, and shall be provided with conditions for free formation of their will and its free expression when voting. International observers have been invited to monitor the election process across the 33,540 polling stations in Ukraine to see first-hand that each Ukrainian citizen has a free and private vote. § 225 MPs shall be elected on the basis of a simple majority system in single-mandate election districts. With the quantitative composition of the Verkhovna Rada of Ukraine (Parliament) being 450 MPs, any party would need to win 226 seats to win an outright majority.